The need for an investigational drug or biologic may arise in an emergency situation that does not allow time for submission of an IND. The FDA can authorize shipment of the test article (drug, biologic or device) in advance of the IND submission. Requests for an authorization may be made by telephone, fax or email using the FDA contact information provided in 21 CFR 312.310 or the FDA Information Sheets. 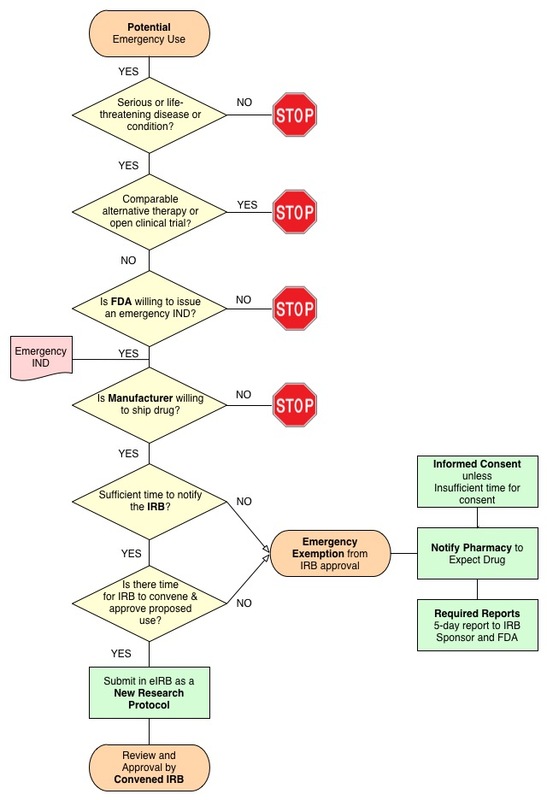 The FDA requirements and regulations for an emergency IND for the use of an investigational drug or biologic are slightly different than for an emergency use of a device. In both situations, FDA must conclude that the use is for a "serious or life-threatening disease or condition and there is no comparable or satisfactory alternative therapy to diagnose, monitor, or treat the disease or condition." Emergency Use is a special case of the Expanded Access to Investigational Drugs for Treatment Use. Most of the time, the IRB will have sufficient time to review investigator's requests for expanded access to an investigational drug. Even though only a single individual (or a small group) will receive the investigational drug, this is considered research (a clinical investigation) under the FDA regulations. On October 3, 2017, the FDA issued new guidance regarding individual patient expanded access INDs. The new pathway still involves a submission to the IRB, but the IRB can now provide concurrence by the chair or another IRB member (rather than review and approval by the convened board). To use this pathway, the sponsor-investigator needs to request 'Authorization to Use Alternative IRB Review Procedures' from the FDA. This can be done either on form FDA 3926 (section 10.b. ), or, if submitting using a 1571, by a separate attachment to the FDA. Note: This pathway is only available when a physician sponsor-investigator will hold the IND; it is not available when the pharmaceutical sponsor will hold the IND. To obtain concurrence, the sponsor-investigator should select "Clinical Investigation involving a single human subject (e.g. 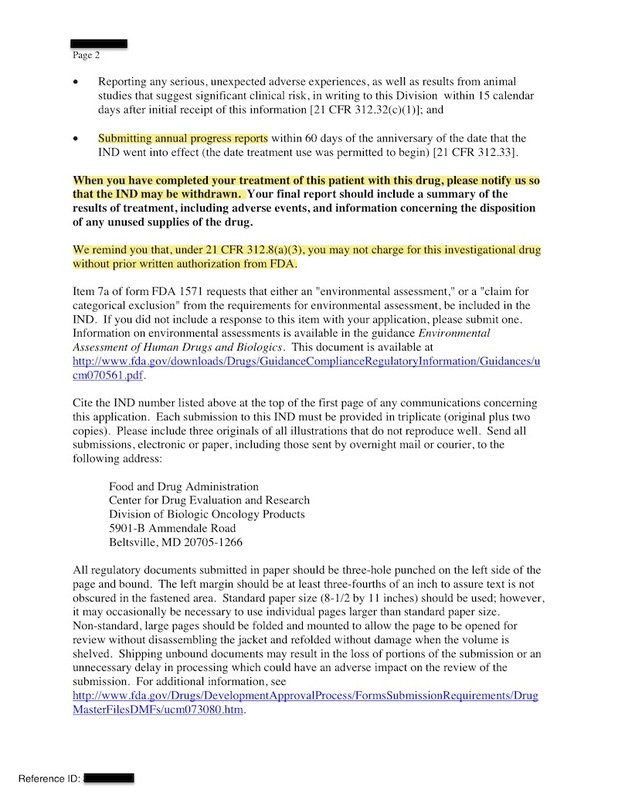 emergency IND or IDE); CHOP IRB has time to review" in eIRB, complete the abbreviated submission and attach the documentation submitted to the FDA (e.g. Form 3926). The FDA mans a hotline 24 hours a day, 7 days a week for emergency requests. Click on the links for the FDA contact information. FDA's Expanded Access Contact Information. Investigational Drugs for Treatment Use – Questions and Answers covers issues related to the treatment use of investigational drugs for a single individual, as well as intermediate and large size trials. FDA page for Physician Request for an Individual Patient IND under Expanded Access for Non-emergency or Emergency Use. FDA page with educational information regarding IDE Early/Expanded Access. A stage of disease in which there is reasonable likelihood that death will occur within a matter of months or in which premature death is likely without early treatment. A disease or condition associated with morbidity that has substantial impact on day-to-day functioning. Short-lived and self-limiting morbidity will usually not be sufficient, but the morbidity need not be irreversible, provided it is persistent or recurrent. Whether a disease or condition is serious is a matter of clinical judgment, based on its impact on such factors as survival, day-to-day functioning, or the likelihood that the disease, if left untreated, will progress from a less severe condition to a more serious one. The requirements for emergency use of a drug are included in the new (2009) 21 CFR 312 Subpart I: Expanded Access to Investigational Drugs for Treatment Use. Expanded Access includes single patient use, intermediate-size population use, and treatment use or treatment INDs. The requirements for all three types of expanded access in 21 CFR 312.305. The detailed requirements for a single patient use, including emergency use, can be found in 21 CFR 312.310.
if the conditions of 21 CFR 56.102(d) are met (see information box to the right) and it is not possible to convene a quorum/chair concurrence within the time available, the use may proceed without any IRB approval/chair concurrence. This latter option is also known as an Emergency Exemption from prospective IRB review. The Emergency Exemption is for a single patient use. If the investigator anticipates the need to use the same drug for a second individual, then they must prepare a protocol for IRB approval for the proposed use. "The exemption, which may not be used unless all of the conditions described in 21 CFR 56.102(d) exist, allows for one emergency use of a test article without prospective IRB review. FDA regulations require that any subsequent use of the investigational product at the institution have *prospective IRB review and approval. FDA acknowledges, however, that it would be inappropriate to deny emergency treatment to a second individual if the only obstacle is that the IRB has not had sufficient time to convene a meeting to review the issue." Immediate life-threatening situations typically occur with short notice although occasionally the planned use can be foreseen 3 or 4 weeks in advance. When there is sufficient time, the IRB must review the proposed single patient use. When there is insufficient time for IRB review, the Investigator may exercise the Emergency Exemption from prior IRB review and administer the investigational drug. The investigator must obtain the manufacturer's agreement to ship the drug or to use part of the drug supply available at CHOP as part of another clinical trial. Either the investigator or the sponsor-IND holder must obtain an IND from the FDA for the emergency use. The FDA maintains 24 hour coverage for emergency INDs (see above). When there is sufficient time, the investigator should contact the IRB as soon as possible to determine whether or not the IRB can issue concurrence or convene and approve the emergency use. When there is insufficient time, the investigator may exercise the Emergency Exemption from prospective IRB review and must follow the procedures outlined in IRB SOP 802.
either evidence of IRB approval/concurrence or notice that the investigator is exercising the Emergency Exemption. The drug must be shipped to the Pharmacy to maintain the appropriate chain of custody. The Pharmacy will not accept medications shipped to the investigator without proper shipping and storage information. If the Emergency Exemption is exercised, the IRB must be notified via the Emergency Use pathway in eIRB (check "Emergency Use of Investigational Agent" in section 1.01). There is an option to notify the IRB prior to the use. Regardless of whether an initial notification is file the investigator must complete a 5-day Report so that the IRB can ascertain that the use was appropriate. The investigator must report the use, including adverse events to the FDA. because of the immediate need to use the device, there is no time to use existing procedures to get FDA approval for the use. Authorization from the IDE holder, if an approved IDE for the device exists. If an IDE for the use does exist, notify the sponsor of the emergency use, or if an IDE does not exist, notify FDA of the emergency use and provide FDA with a written summary of the conditions constituting the emergency, subject protection measures, and results. Subsequent emergency use of the device may not occur unless the physician or another person obtains approval of an IDE for the device and its use. When an investigator holds the IND or IDE for a single subject, they are none-the-less the study sponsor. The FDA's enumerates the responsibilities of sponsors at 21 CFR 312.50 - 70 (Subpart D) Responsibilities of Sponsors and Investigators. 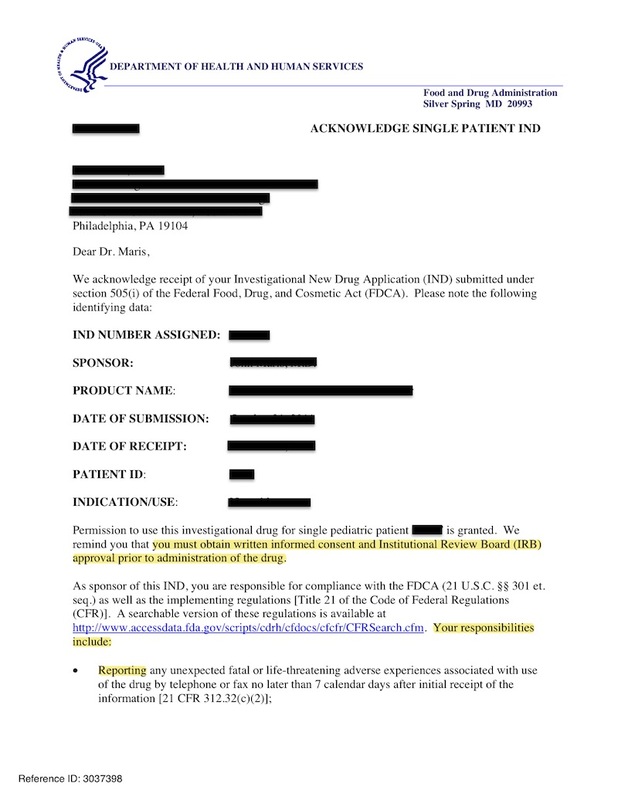 An example of the type of letter that the FDA will send confirming that they have granted the single-subject IND are included below. The subject is confronted by a life-threatening situation necessitating the use of the test article. Informed consent cannot be obtained because of an inability to communicate with, or obtain legally effective consent from, the subject. Time is not sufficient to obtain consent from the subject's legal representative. No alternative method of approved or generally recognized therapy is available that provides an equal or greater likelihood of saving the subject's life. If, in the investigator's opinion, immediate use of the test article is required to preserve the subject's life, and if time is not sufficient to obtain an independent physician's determination that the four conditions above apply, the clinical investigator should make the determination and, within 5 working days after the use of the article, have the determination reviewed and evaluated in writing by a physician who is not participating in the clinical investigation. The investigator must notify the IRB within 5 working days after the use of the test article (21 CFR 50.23(c)). 21 CFR 312: Subpart I This subpart includes the FDA regulations deal for all aspects of expanded access to investigational drugs, including emergency use.